This is a fairly recent historical times when the spped of change has been accelerated language by the general intensification of life and improved means of communication that contributed to the spread of new words and teir forms. Four thousand years ago, languages have evolved more slowly. Along the way, it should be noted that Bulgars populated Central and Northern Europe Bulgars were not the ancestors of the modern-day Chuvash, they were assimilated by the newcomers in following time. Also Chuvash are only one of the Bulgarish tribes who always remained in Eastern Europe. 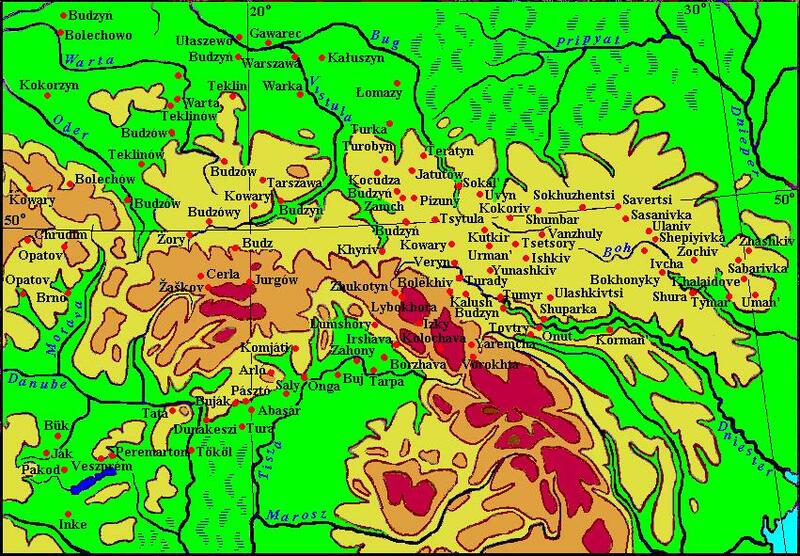 The highest density of Bulgarish place names is noted in Western Ukraine and Eastern Poland. Hence the Bulgars as carriers of CWC moved along the Carpathian Mountains to the west and north to the Baltic. Sites of CWC are absent in Hungary, thus the Bulgars moved there at Scythian time. Hungary, Poland and Western Ukraine. Map scale don't let show all place names in their greatest concentrations. Furthermore, Bulgar place names are found in large quantities in the Czech Republic, Germany, the Baltic States, Finland, Sweden and while continuing search it becomes impossible to display their extension on conventional maps. In such circumstances, there is no choice but to apply the new data to the map in the system of Google Map (see below). Bolechowo, a village in Greater Poland Voivodeship – Chuv pulǎx ”fertility”. Cerla, a locality in the village of Laliki in Silesian Voivodeship – Chuv. çĕrle "night, to night". Cerle, a village in Kilec Voivodeship – Chuv. çĕrle "night, to night". Jatutów, a village in Lublin Voivodeship – Chuv yat "good name, honour", ut "a horse". Jurgów, a village near Zakopane in Lesser Poland Voivodeship – Chuv çărkha (Common Turk.ic jorğa/jurğa) "ambler, pacer". Jurgi, a village in WArmian-Mazurian Voivodeship – Chuv çărkha (Common Turk.ic jorğa/jurğa) "ambler, pacer". Lomazy, a village in Lublin Voivodeship – Chuv lăm uççi "open place". Łomża, a village in Lublin Voivodeship – Chuv lăm "moiture, humid, dew", shav "everywhere, entire". Poronin, a village near Zakopane in Lesser Poland Voivodeship – Chuv părăn "to twist". Tarszawa, a village to the north of Jędrzejow in Świętokrzyskie Voivodeship – Chuv tără "clean" and shyvĕ "river". Tenczyn, a village in the administrative district of Gmina Lubień, Lesser Poland Voivodeship – Chuv tĕnche "world, environment". 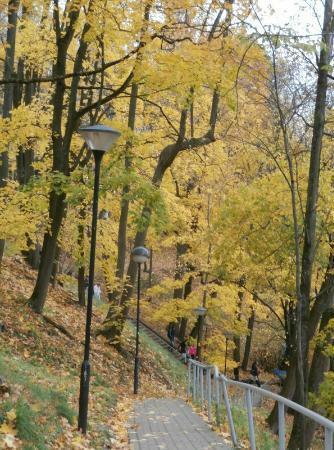 Warszawa (Warsaw), the capital – to Chuv shyvĕ "river" can be suited by Cuv var "ravine" but Chuv văra "mouth" is better, as Warsaw lies at the mouth of the Western Bug River flowing in the Vistula. Zamch, a village to the southwest of Tomaszów Lubelski – Chuv çămkha "a ball" or çamka "forehead". Zaszków , a village in Masovian Voivodeship – Chuv shashka "a mink"
Churáňov, a setllement in Southern Bohemia – Chuv khurăn "birch". Opatov, a village and municipality in the Vysočina Region, a village and municipality in the Pardubice Region, a small town in the Vysočina Region, a metro station in Prague – Chuv apat "food, forage". Plzen, a city in Bohemia – Chuv pĕl "to know", çĕn "to overpower". Prague, the capital of Czech republic – Chuv păraka "draf, mash". Turzovka, a town in the Čadca District, Žilina Region in north-western Slovakia – Chuv tarçă "a servant, hind". Žaškov, a village and municipality in in the Žilina Region of northern Slovakia – Chuv shashkă "a mink". Askim a town and a municipality in Østfold county, Norway. – Chuv ăs "to scoop", kimĕ "a boat". Jeløya an island in the municipality of Moss – Chuv yĕlĕ 1. "rain worm", 2. "tear (eye-water)". Kambo a village in the municipality of Moss – Chuv kămpa "mushroom". Oslo, the capital of Norway – Chuv aslă "great, major". Ørmen, a village in Fredrikstad municipality – Chuv vărman "forest". Son, an old town in Vestby municipality – Chuv aslă 1. "face", 2. "view", 3. "colour". Spro, a village in Nesodden municipality – Chuv săpray "the common name of tools, e.g. tools of fishery". Arendal, a town in Aust-Agder county, Norway – Chuv uram "street", dal "area outside house", "outside". Helsinki, the capital city of Finland – Chuv. khĕl "winter", sĕnk, sĕnkke "doze", "slumber". In the etymological dictionary of the modern Finnish language it is indicated that the name of the city has various explanations, but the hypothesis of its Swedish origin is considered to be the most acceptable. Allegedly, in the early Middle Ages, the Swedes arrived in this area and called it in some similar way, but how it is not specified (HÄKKINEN KAISA. 2007: 185). Jurgiškės, a village in Lithuania – Chuv çărkha (Common Turkic jorğa/jurğa) "ambler, pacer". Kunda, a town and the Kunda River, Estonia – Chuv khuntahelp, assistance"
Läby, a locality in Uppsala County, Sweden – Chuv lapă "flat plot", "glade". Mandal, a town in Vest-Agder county, Norway – Chuv măn "large, great", tul "area outside of house", "outside". Nereta, a town in Latvia – Chuv neret "a kind of fish-net"
Onsala, a locality in Halland County, Sweden – Chuv an "wide", sulă "raft", "ferry". Pärnu, a city in southwestern Estonia – Chuv parne "a gift, present, sacrifice". Quoluwany, the ancient name of the city of Talllin, Estonia – Chuv külĕ "lake", văn imitation of buzz, buzzing. Explanation of the name is such: Clouds of mosquitoes flying over the lake and buzz. Cf Szurpily. Salo, a town in Finland – Chuv sulă "raft", "ferry" or sala "a great village". Sösdala, a locality in Hässleholm Municipality, Skåne County, Sweden – Chuv süs "hemp fiber", tăla "cloth"
Tartu, a city in Estonia – Chuv tără "summit" and tu "a mountain". There is in the city the mountain Toomemägi. Torsås a locality in Kalmar County, Sweden – Chuv tur (tură) "devinity", sas "voice". Uppsala – Chuv appa "an old sister, aunt", sulă "raft", "ferry". Turkic ethnicity of creators of CWC makes readers question. This is especially true for readers from Western Europe. For more convincing separate map has been drawn up of sites CWC and Bulgarian place names in Germany (see below). The icons as lights show sites of CWC in Germany, and points are place names decrypted with the Chuvash language. Some of them are listed below. Aisch, Neustadt an der Aisch, a small town in the northern part of Bavaria – Chuv uj "field", jysch "family, owner, farm" (in other Türkic jiš "forest"). Ascha, a municipality in the district of Straubing-Bogen in Bavaria – Chuv ăšă "warm". Aspach, a commune in the Haut-Rhin department in Alsace in north-eastern France, a commune in the Moselle department in Lorraine in northeastern France, a community in the Rems-Murr-Kreis in Germany (Baden-Württemberg), a village and a former municipality in the district of Gotha in Thuringia, a municipality in the district Braunau am Inn in the Austrian state of Upper Austria, – Chuv. ash "to puddle, knead mud, wade", păkh "bog, mud, slush, faeces". Bacharach, a town in Rhineland-Palatinate, – Chuv. păhăr "copper", akh "evil spirit". There is forty kilometers to the south-west from the town historic copper mine Fischbach, open to visitors. In the town there is a restaurant "At copper jug". Basel, a city in Switzerland – Chuv păsăl "to spoil, deteriorate, become worse"
Baruth – Chuv par "to give,pay, sell", ut "a horse"
Böhl-Iggelheim, a municipality in the Rhein-Pfalz-Kreis, in Rhineland-Palatinate -Chuv ikkĕle "to double", ikkĕllĕ "duality". The historical coat of arms of Iggelheim with the balance can symbolize the duality of the court (see left). – Chuv parne "present, gift". Chrudim, a city in Eastern Bohemia – Chuv khěrü "hot, passionate" and tim "assiduity". Cottbus, a city in Brandenburg, – Chuv kat "dike, dam" and păs "to break, disturb". Fürth, a city in Bavaria, – Chuv pürt "peasant house". Gera, a city in Thuringia, – Chuv kĕrĕ "strong, solid, massive". Gerach, a municipality Rhineland-Palatinate and a community in Upper Franconia (Bavaria) – Chuv. kĕr "autumn", akh "evil spirit". Goslar, a town in Lower Saxony – Chuv kas "village", lar "to reside, sit"
Hadamar, a town in Hessen – Chuv khăt "comfort, beauty, luck", ămăr "warm and still". Hartha, a town in the district of Mittelsachsen, in the Free State of Saxony – Chuv khărta – 1. "patch, clout", 2. "rough country". Itzehoe, a town in Schleswig-Holstein – Chuv ĕç "work", khăyă "light, fire". Jastorf, a village in Lower Saxon – Chuv yăs "smoke", tărpa "chimney". Jena, a University city in Thuringia – Chuv yĕnĕ "den, lair, couch". Jürgenshagen, a municipality in the Rostock district of Mecklenburg-Vorpommern, Germany – Chuv çărkha (Common Turkic jorğa/jurğa) "ambler, pacer". See Zorge. Jürgensby, a part of the city of Flensburgs – Chuv çărkha (Common Turkic jorğa/jurğa) "ambler, pacer". See Zorge. Jürgenstorf, a municipality in the Rostock district of Mecklenburg-Vorpommern, Germany – Chuv çărkha (Common Turkic jorğa/jurğa) “ambler, pacer”. See Zorge. Jüterbog, a historic town in the Teltow-Fläming district of Brandenburg – Chuv yüte "to be exhausted", păk "to sleep, die"
Kandel, a town in the district of Germersheim, in Rhineland-Palatinate and a mountain of the Black Forest – Chuv kăn "potash", tĕl "place, country". Potash was recieved from wood in the Black Forest long since. There is the village of Kantelina in Vinnytsia Region of Ukraine. Kiel, the capital of northern German state of Schleswig-Holstein – Chuv kil "house, family, yard". 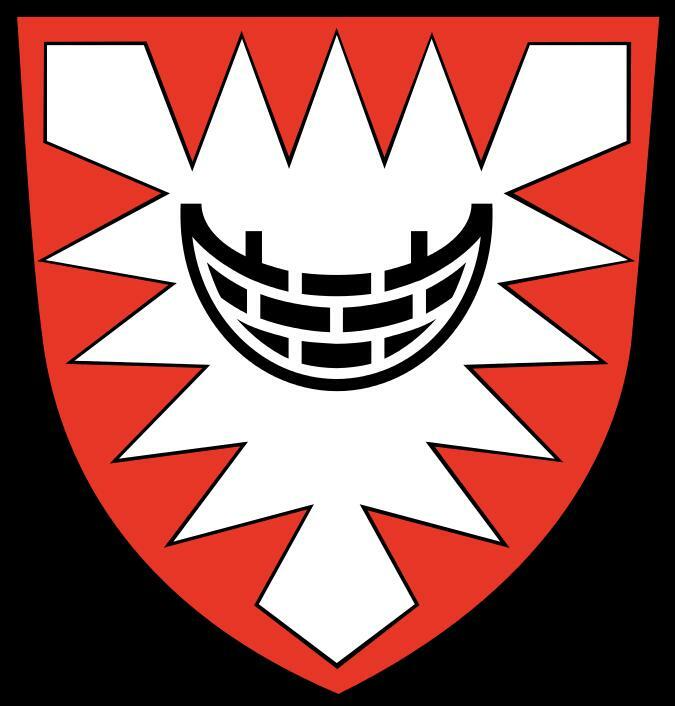 The coat of arms of the city of Kiel is the so-called Holstein nettle leaf. The brick-built boat symbolizes city rights by the association with city-courtyard wall (see left). Kirkel, a municipality in the Saarpfalz district, in Saarland – Chuv khyr "pine-tree", kĕl "ashes". Kyritz, a town in the Ostprignitz-Ruppin district, in Brandenburg – Chuv kĕr "autumn", eç "work". There is in the center of the city Coat of arms a golden sheaf symbolizing the finish of field work (see. right). Nailaa, a town in Bavaria – Chuv. 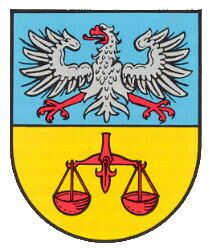 năyla "to drone, hum, buse"
Nohra, a municipality in the Weimarer Land district of Thuringia, – Chuv nakhra "horn". Nürnberg (at first Nuremberg), a city in the state of Bavaria – Chuv nür "moist, humid", en "site, land". This explanation is confirmed by preserved alluvial sediments of floods of the Pegnitz River in the northern and north-eastern part of the city. Pankow, the highest populated and the third borough of Berlin – Chuv pankav "silly"
Parchim, a town in Mecklenburg-Vorpommern – Chuv par "to give", khĕm "fire, flame". 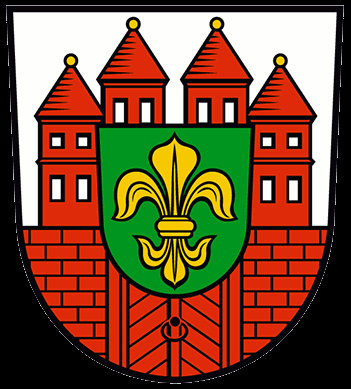 Perkam, a municipality in the district of Straubing-Bogen in Bavaria – Chuv pĕr "lonely, single, whole, allein, alike", kăm "ash". Salem, a municipality in the Bodensee district of Baden-Württemberg – Chuv selĕm "good, nice, beautiful"
Tarthun, a village and a former municipality in the district Salzlandkreis, in Saxony-Anhalt – Chuv tărtan "to swell", turtăn "to stretch out, lengthen", turtăm "load"
Teklenburg, a town in the district of Steinfurt, in North Rhine-Westphalia – Chuv tĕkle "still, quiet". Zorge, a municipality in the district of Osterode, in Lower Saxony, Germany – com Türk. jorğa/jurğa "troat, amble" (Chuv çărkha). 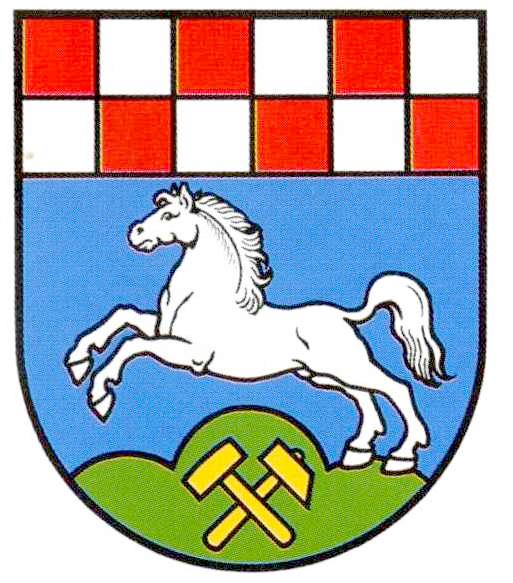 The municipality has the coat of arms with jumping horse (see left). The meaning of the name remained in human memory during long centuries. So, we have a few matches between place names of Bulgarish origin and heraldry. Some of them may be random, but in other cases the name is explained by motivation of terrain features or probability of correspondences seems unlikely (as in the case of s name Zorge). There are two possible explanations for this phenomenon: 1. The population of Türkic origin coexist with the new settlers (the Celts and later the Germans) for several millennia and was assimilated already at historical time. 2. Interpretation of the names given by Türks remained in the memory of the local population regardless of its language during the same time.